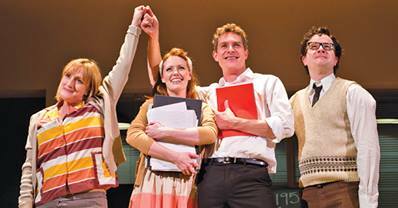 On Wednesday night, October 23rd, a nationwide showing of the London revival of “Merrily We Roll Along” had theatre fans flocking to the cinema (in St. Louis it was at the Mills Theatre and the Gravois Bluffs Theatre). This version of the Stephen Sondheim near-hit is probably the best one yet- although it’s still not perfect. But that’s the nature of this show. It’s always been one of his best scores but some of the songs and parts of the book by George Furth (based on the original Kaufmann and Hart play of the same name) have always had some problems. Although almost two and a half hours long, it’s still the most streamlined version and the outstanding cast, performing at the Harold Pinter Theatre, is stellar. Maria Friedman’s direction is crisp and clean and that helps move this multiple set show along- thanks to the versatile basic set by Soutra Gilmour. Since the show is presented backwards with an intense fight scene at one of Franklin Shephard’s parties begins the evening, it starts out heavy but then gets lighter and more hopeful as the evening continues and we see the three friends and those around them regressing back to the rooftop where they first all got together and sing the stirring “Our Time.” Getting there, however, is sometimes pretty rough as failed marriages, failed expectations and different ideas on career paths make for complications and eventually break up the old gang. And thus, the first scene is full of bitterness and consternation. Mark Umbers is rock solid as Franklin Shepard, the gifted composer who early on teams up with Charlie Kringas who writes his lyrics and then Mary Flynn who begins putting together reviews for them to perform in basement clubs and wherever else they can showcase their talents. Mr. Umbers transforms from his haughty and gregarious self in the opening scene and transitions back into the energetic songwriter who is surprised when people really like his music. As his lyricist, Charlie, Damian Humbley is spot on. He shines throughout and particularly in the frenetic “Franklin Shephard Inc.” number during an NBC interview where he gets all of his frustrations out at the expense of Shepard. Jenna Russell is simply fantastic as their friend, Mary. Her lifelong infatuation with Frank doesn’t deter her from writing a best selling novel but she never manages to express her feelings and the audience knows it would do no good anyway. She tosses off laugh lines with ease and displays a crystal clear singing voice. 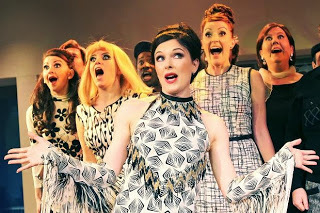 As their first female foil in their reviews, Beth, Clare Foster plays an ingenue with a Southern charm who manages to charm the pants off of Frank. This leads to his first marriage. But before we get “back” to that point, we see Frank’s infatuation with Gussie, the star of his and Charlie’s first show. She’s got her eye on him from the moment she and her husband spot them in one of their supper club gigs and she invites them to one of her posh parties to introduce their newest song, “Good Thing Going.” She’s the perfect vamp as she begins to wrap Frank around her finger and eventually “steals” him away from Beth. 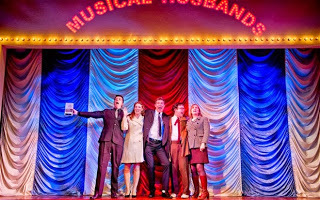 As her husband, Joe, Glyn Kerslake is suave and the producer with power who finally signs them to write their first musical, “Musical Husbands”- even though (as we later see) he rejected them the first time they met him at his office with some of their material. 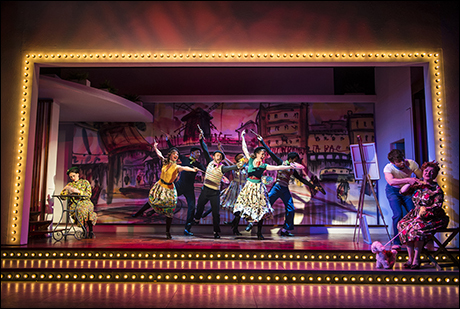 This reverse telling of the story is not too complicated as Sondheim’s songs remind us throughout that we’re traveling back in time to eventually see these three friends from the beginning. The exhilaration, the phony friends, the obvious power struggles within the friendship and those from outside sources as Franklin soon takes a different path than Charlie thinks he should, all add up to a compelling musical and, with that soaring score of Stephen Sondheim, it just makes for a perfect evening. It’s a polished production and, as I said, probably the best version of “Merrily We Roll Along” that’s been rolled out thus far. This entry was posted on October 24, 2013 at 9:43 pm10 and is filed under Uncategorized. You can follow any responses to this entry through the RSS 2.0 feed. You can leave a response, or trackback from your own site.